Originated by Chet Tompkins of Oregon and registered by Paul Aden of New York in 1978, this medium to large size hosta has chartreuse leaves with multicolored streaks. It has funnel shaped, lavender flowers on 22 inch scapes. This cultivar is considered unstable and may revert into the plain, light green plant shown above or into a creamy/yellow medially (center) variegated cultivar H. 'Shade Fanfare'. According to The Hostapedia by Mark Zilis (2009), "...origin: (X-ray bombardment of a gold seedling...attracted the attention of just about every hosta collector in the early 1980s...Thousands of 'Flamboyant' plants were propagated and sold, but after being grown for a while, it was realized that they were something different...has faded in importance as a garden plant, but continues to be used by a few hybridizers." Warren I. Pollock in The Hosta Journal (1992 Vol. 23 No. 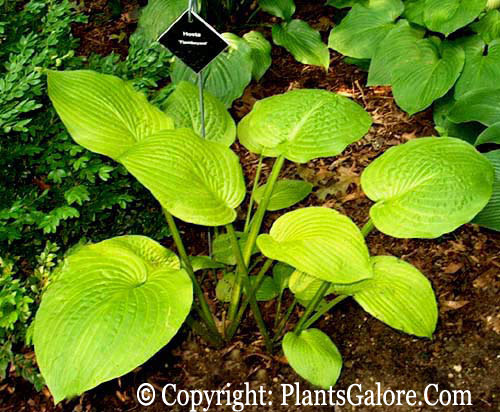 2) states that, "H. 'Flamboyant' with its streaked variegation was a "must have" hosta at that time. The problem was that many who purchased it found that it started to turn - and in many cases had completely turned - into 'Shade Fanfare' a year or two later." Bob Solberg wrote in The Hosta Journal (1994 Vol. 25 No. 2) that "William and Eleanor Lachman crossed the better blues of Eric Smith with their own line of variegated 'Beatrice' and 'Flamboyant' hybrids to yield a large group of blue hostas with cream to white variegation - unlike any previously introduced: 'Cherub'...and 'Crusader'...both registered in 1989 are two examples of this breakthrough. Some may also consider the Lachman's earlier introductions of 'Carnival' and 'El Capitan' as breakthroughs for their substance and bright gold edges, although 'Galaxy', their streaked sibling, is of more value to hybridizers. All have 'Beatrice' and some 'Tokudama' in their pedigrees."